Venice is one of those dream destinations that we all want to visit one day or another. Once you’re in Venice, you realise what the hype is all about and why the city is so unique and magical. The architecture, the small alleyways, the canals, the reflections of the buildings in the water, the gondolas and the fact that there are no cars, buses or lorries all give this city in Northern Italy a wonderful touch. 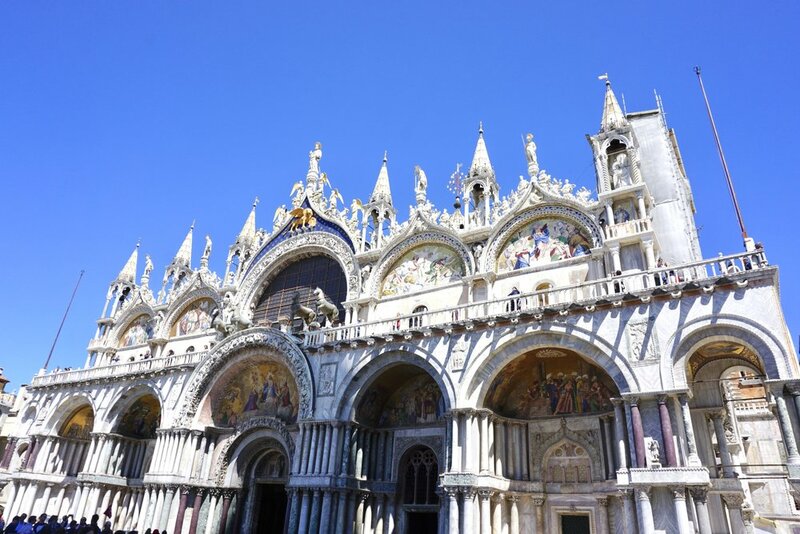 Don’t be disheartened by its popularity and make your way over to Venice as I can assure you that you will fall in love with its charm like I did and how everyone else does. Venice in one of those cities that can be visited all year round. I’m not really sure if there’s a particular time of the year when it’s more quite. However, it’s so nice when it’s warm to enjoy your walks along the canals that I think spring is the ideal time because I can imagine the heat being rather unbearable in the summer. Options are limited in Venice and this is what’s so great about the city. In any case, walking is always the best way to explore a city in my opinion. You can also get a private taxi boat or use the public boats to get around Venice. Gondolas are more of a tourist attraction nowadays and considering that it’s 120€ for 45mins I doubt you will be using this as your main type of transport (even though you should of course go on a gondola ride once to enjoy the unique experience). This is clearly the most popular spot in Venice and it’s absolutely stunning. The architecture of all the main landmarks is spectacular however it does gets extremely crowded... On the square you will find the famous Doge’s Palace and Saint Mark’s Basilica (we didn't go inside unfortunately because the queues were too long for us and we just wanted to make the most of being outside on this wonderful sunny day). The island of San Giorgio Maggiore is a perfect place to get away from the crowds. You can go up the tower of the church and admire the most beautiful panoramic views over Venice. We spent quite a while just gazing over Venice from the top and were blown away by this beautiful sight. You cannot leave Venice without going on a gondola. Despite the high price it really is worth it, especially if you’re travelling on a romantic occasion. It's so nice to see Venice from the water and the gondoliers generally give you some insider knowledge about the buildings and monuments you pass by. The beautiful coloured houses of Burano are enough to make you want to visit this charming little island only 30 mins away from Venice by vaporetto. It’s ideal to spend a few hours in the morning or afternoon walking around the canals and admiring the charming houses with the colourful reflections in the bright green water. Burano is known for its lace work and there are lot's of boutiques where you can buy lace pieces. The Church of San Martino is also a popular attraction on the island. This delicious summer aperitivo drink which became very popular in the 50s and originally comes from Padua in the Veneto region. After a tiring day wandering around Venice, sit back and enjoy a fresh Aperol Spritz. I recommend the Terrazza Danieli and Di Pisis for the perfect aperitivo view. These parts of Venice are less popular amongst tourists who generally tend to stay around San Marco and the Grand Canal making it so enjoyable to stroll around. You will also come across some beautiful churches and basilicas which you must visit inside. We came across the The Medical Library at Scuola Grande of St Mark's (one of the most ancient schools in Venice) in Castello and were impressed by the gorgeous gold platted ceiling inside on the top floor. Like anywhere in Italy, there are some fantastic restaurants in Venice. Many places are aimed at tourists in general meaning that the quality isn’t as good. Some of the places I loved and which I highly recommend are: Paradiso Perduto, Trattoria da Remigio, Osteria Oliva Nera & Trattoria La Madonna. The rule in Venice is to enjoy one gelato a day. There are many delicious gelaterias in Venice but I highly recommend Suso and Gelateria Nico. The ice creams are light and full of taste making it easier to order the large ones and being able to actually finish them. Ibiza: Is it only a bling-bling party island?